This section is companion to related Mapping Census Blocks section. It is focused on use of GIS tools and resources for visual, mapping and geospatial analysis of urban/rural patterns by census block. Applications illustrated here make use of the Austin-Round Rock, TX metro; similar views/applications may be developed for any county or metro. Members of the ProximityOne User Group ( join now, no fee) may use the GIS software and project files to create similar and more detailed views/analyses. For Census 2010, an urban area is a densely settled core of census tracts and/or census blocks that meet minimum population density requirements, along with adjacent territory containing non-residential urban land uses as well as territory with low population density included to link outlying densely settled territory with the densely settled core. To qualify as an urban area, the territory identified according to criteria must encompass at least 2,500 people, at least 1,500 of which reside outside institutional group quarters. Rural encompasses all population, housing, and territory not included within an urban area.  install the Windows CV XE GIS softwareon your computer.  expand the GIS project fileset to c:\cvxe\1\ folder (User Group userid required).  open the GIS project c:\cvxe\1\austinblks1_tract.gis (File>Open>Dialog). 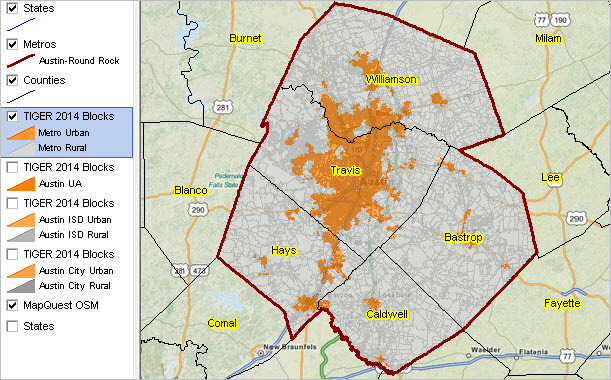 Each of the "TIGER2014 Blocks" layers shown in the map graphic legend panel uses the same Austin metro 5-county TIGER 2014 census block shapefile (TL_2014_48_TABBLOCK10_12420.SHP). The shapefile dBase file field attributes are shown in the scroll section below. 110 AIANHHSC C 2 American Indian Area/Alaska Native Area/Hawaiian Home Land Size Code . Note that the geographic area codes are Census 2010 vintage. For example, the CBSA code is 2009 vintage and does not reflect the February 2013 CBSA designations. Notable geographies potentially affected: city/place, school district, congressional district, state legislative district, PUMA. The following notes summarize general steps to develop the above applications for any area. The 1) Census 2010 Summary File 1 (SF1) Urban/Rural Update Files and 2) TIGER 2014 census block shapefiles are packaged for download as a single zip file for each state. It is recommended that the "target" geographic area be one county or a set of counties (e.g., a metro) rather than an entire state.  State by state folders contain a state zip file with the geoheader file, 48 data segments.  Expand the *geoheader segment only* from the state zip file of choice to the folder c:\cvxe\1\. - this is normally the last file listed in the zip file and has name ? ?geo2010.ur1 where ?? is the state USPS abbreviation. - after the file is expanded, rename ? ?geo2010.ur1 to ??geo2010.txt.  Create state SF1 geoheader dBase file: use CV XE Database>dBrowse: open sf1geo.dbf (download here and save to c:\cvxe\1\); User Group ID required) and import the geoheader file (??geo2010.txt). - use CopyTo (button below table) to copy the table to c:\cvxe\1\? ?sf1geo.dbf where ?? is the state USPS abbreviation.  Upon successful completion of this task, and for applications discussed here, the zip file and expanded files may be deleted.  Step 1 is complete. Close CV XE and restart when needed.  Download and open the state zip file with an unzip program.  Use CV XE File>Export Shapefile to reduce the scope of the statewide file to one county or a set of counties. - the Export Layer form appears; enter the county selection query in the "Query statement" edit box. - click OK and you are prompted for the output file name. ... in this example, "12420" is the Austin-Roundrock CBSA code. - click OK and the export begins.  Step 2 is complete. Close CV XE and restart when needed.  Proceed after steps 1 and 2 completed.  Open file 1 as dbf output from step 2; select all; move all.  Open file 2 as dbf output from step 1; select all; move all.  Click Merge button and wait for completion. This completes the this subsection.